Fill in your email address in the sign up box above or — if you’re on a mobile device — click Newsletter under Navigation. 1. A free ebook, which will remain a mystery until you get it. 2. My newsletter with book updates, price drop specials, excerpts, info & more. IMPORTANT: I use a service called BookFunnel to deliver the free ebook to you. It may take a few steps depending on your reading device. If you have trouble, just tap the Help link at the top of the book download page. My emails only come as frequently as I have news for you. If a new preorder goes up, a new book comes out or an old one is reissued, if there’s a cool deal that I can get word out on fast, an event or podcast I’m part of…well, you’ll get a note. 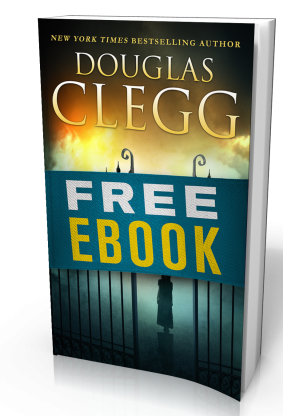 Douglas Clegg News began in early 1999 when Doug launched the world’s first ebook serial novel in weekly installments. This occurred a decade after his first novel Goat Dance came out from Simon & Schuster. That ebook serial novel, Naomi, was called “the first major work of fiction to originate in cyberspace,” by Publishers Weekly. With his fiction published in hardcover, trade paperback, mass market paperback and in ebook, Clegg has written more than 35 books, which have been translated into more than a dozen languages around the world. Although he has written in the genres of horror, suspense, historicals and dark fantasy, he considers himself a writer of dark fiction.